For an exhilarating dolphin tour, get your tickets for Sea Thunder. This turbocharged boat boasts 2100 horsepower and can hold approximately 141 passengers. 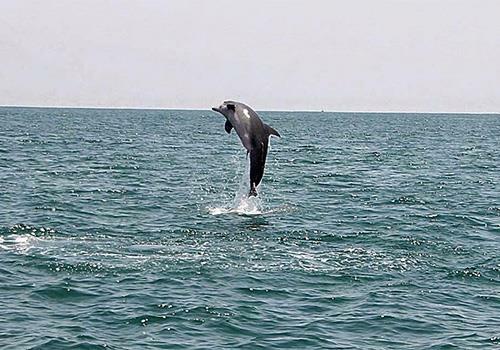 Get ready for remarkable ocean views and exciting dolphin watching on this memorable cruise. When the captain gives you the signal, you’re free to walk around the boat and find the best views! Canopy seating available. You will get wet. Dress accordingly. A dry box is available on the boat for valuables. For seating under the canopy, arrive early as seating is by groups. Check-in is inside the Captain Juel’s Hurricane Restaurant. Check-in 30-45 minutes before departure for an earlier boarding group. 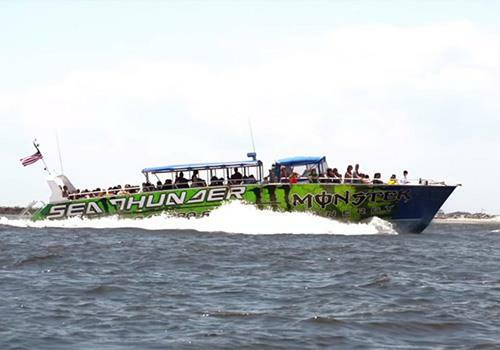 The Sea Thunder boat holds approximately 141 passengers. 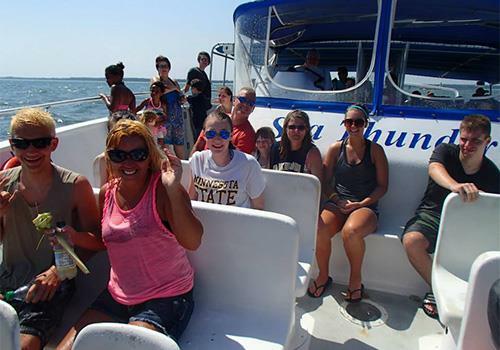 Come join us on the best dolphin tour in Myrtle Beach. 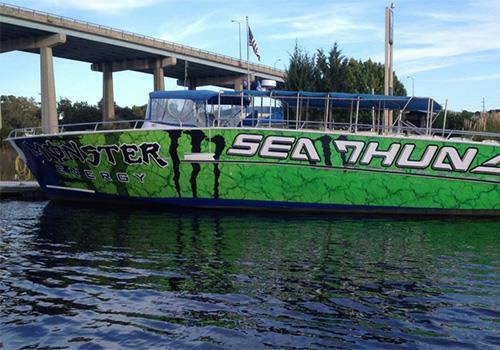 The Sea Thunder is a 65 foot 1997 Aqua Bay Marine tour boat powered by turbocharged Cat Diesels, totaling 2100 horsepower. The Sea Thunder holds approximately 141 passengers. Everyone is able to sit and when the Captain gives the okay you are able to walk around. There is a canopy over several rows of seats on both of our boats. Cruises are 1½ to 2 hours long. The tour encompasses 3 distinct experiences starting with a narrated cruise up the Intracoastal waterway. Then picking up speed and passing several uninhabited islands as well as the jetty heading out into the ocean. The second part of the tour is heading into the ocean to find and view the dolphins and the third part is picking up speed to view our beautiful coastline. This is a wet ride so dress accordingly. There is a dry box on board for your valuables. We do suggest a bag or case to keep cameras and phones dry so that you may take pictures. Sun glasses and sunscreen are also highly recommended for this tour. If you want SEATING UNDER THE CANOPY please arrive early because boarding is done by group #. Group #1 will board first and will include several parties who arrive the earliest. Check-in for the tour is located at the Harbourgate Marina Office and check-in time is 45 to 30 minutes before the boat departs. All passengers must check-in and get a boarding pass before boarding the boat. The boat departs promptly at scheduled times so please allow time to park, check-in, etc. Will I get wet on this cruise? Yes. It is likely. Please dress accordingly. It is recommended that passengers bring a light jacket, as well. Do I need to bring anything on the cruise? It is recommended that guests bring a bag for their camera, phone, and other valuables. During the cruise, valuables may get wet if unprotected. A dry box is also onboard for valuables. The tour is approximately 1.5 to 2 hours long. Please check-in at Captain Jules Hurricane Restaurant located at 4499 Mineola Ave, Little River, SC 29566. It is recommended that passengers check-in at the restaurant 30-45 minutes prior to tour departure. The boat is boarded by group number. The earlier you check-in, the better seating you receive. Yes. Parking is half way down Mineola Ave on the left hand side. Look for the Sea Screamer parking sign. Does the cruise operate rain or shine? Yes. In the case that your cruise is cancelled due to extreme weather, please follow instructions given by the crew and staff.